Kinmundy (population 892) is located in south-central Illinois in the northeastern portion of Marion County. Illinois Route 37 is the main road in and out of Kinmundy. Interstate Highway 57 runs just to the west of Kinmundy and even has exit ramps to Kinoka Road about 1 mile southwest of town. The Illinois Central Gulf Railroad runs parallel to Illinois Route 37 as it passes through the heart of Kinmundy. There is a lake to the southwest of town along with several creeks and rivers on each side of Kinmundy as well. Kinmundy was platted in 1857 along the Illinois Central Railroad line. The town derived its name from a town of the same name in Scotland which was the birthplace of William Ferguson, a stock holder in the railroad. We know that Kinmundy once supported its own high school. 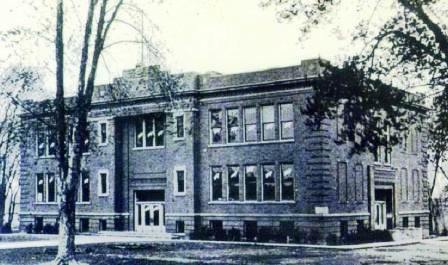 Alma supported its own high school as well through 1940. In 1941 Kinmundy voted to establish a high school district that would include the kids from Alma. In 1953, Kinmundy and Alma voters agreed to establish one unified school district resulting in the formation of the Kinmundy-Alma School District. The high school for the new district was located in Kinmundy, as was the elementary school. Alma hosted the Junior High School for the Kinmundy-Alma School District. Kinmundy-Alma High School and school district served both towns well until a consolidation effort was further realized in 1989. The effort combined Kinmundy-Alma with nearby Farina LaGrove High School. The new district was named the South Central School District with the high school located in Farina. The former Kinmundy-Alma High School building is used today as a grade school for the South Central District. Kinmundy-Alma HS team nickname: the "Hornets"
We know that Kinmundy-Alma High School competed in boys and girls basketball. We believe baseball/softball as well as volleyball were offered too. Kinmundy-Alma High School competed in the Midland Trail Conference. School fight song, and information on sports other than basketball are items we are seeking. The boys' basketball program had some incredibly memorable seasons in their 36-year history. One undefeated regular season and three regional titles hi-lited the Kinmundy-Alma hardwood court success. Several scores involving Kinmundy-Alma High School in the IHSA State Tournament were located on a website titled "Illinois Postseason Basketball Scores." Those found are listed below. Centralia lost in Elite 8 round. WESCLIN (48): Mueller 12, McIntyre 10, Brandmeyer 10, Draper 9, Wutzler 5, Oster 2. KINMUNDY-ALMA (37): Engel 15, Alberson 10, Seeley 6, Robnett 6. STAUNTON (68): Gockel 21, Windau 20, Kasubke 18, Scharff 7, Gueswelle 2. KINMUNDY-ALMA (59): Alberson 18, Robnett 14, Seely 14, McCarty 11, Bott 2. The Kinmundy-Alma girls had some nice basketball seasons as well. Coach David Powless led the ladies to back-to-back Regional Championships in the early 1980's. "Kinmundy- Alma was one of the top schools in Illinois for Student Council in the 1970’s and 1980’s. "During the a Kinmundy-Alma days, Kinmundy had the grade school, Alma had the jr high and Kinmundy had the high school. I attended Kinmundy-Alma my whole school career and graduated in 1989. As far as sports goes, we had boys and girls basketball, boys baseball, girls softball and girls volleyball. Track was never offered when I was in high school. Eventually a track was built behind the old K-A grade school on the East edge of town. But it wasn't even built for a decade or so after the consolidation. I will try to look up the K-A fight song in a yearbook. Randy Tate was my cousin also. Coach Gary Shirley just passed away August 01, 2014."